The skull protects the delicate tissues of the brain. The moving bones of the spine protect the vulnerable communication pathways of the spinal cord and nerve roots. If the nervous system is impaired, it can cause malfunction of the tissues and organs throughout the body, Doctors call this the Vertebral Subluxation Complex. Vertebral, meaning the bones of the spine. Subluxation, meaning consisting of more than one part. Yes, A New Zealand government study found that adjustments are "remarkably safe." 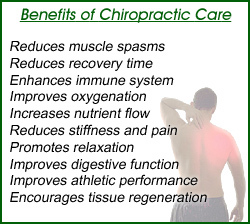 By avoiding drugs and risky surgery, chiropractic care enjoys an excellent track record. A thorough exam can identify the rare person for whom chiropractic care might be unsuited. Doctors of Chiropractic are well educated. The science of chiropractic requires a special emphasis on anatomy, physiology, pathology, neurology, biomechanics, X-ray, spinal adjusting techniques, and related subjects. This demanding curriculum prepares chiropractic doctors to locate the Vertebral Subluxation Complex and help correct the resulting nervous system dysfunction. To graduate with the Doctor of Chiropractic degree, each candidate passed the demanding National Board Examination. Then, doctors apply to a governmental or professional licensing board and pass a still more difficult test before being granted the privilege to practice.